He and Garland were classmates in the Horticulture Program at Santa Barbara City College and often discussed going into business together. 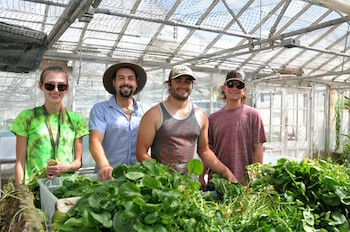 After graduation, the pair rented a greenhouse at The Orchid Ranch perched on cliffs overlooking the Pacific Ocean, purchased pre-owned equipment for an aquaponics operation, and opened Eco Conscious Aquaponics. They grow lettuces, microgreens, and vegetables, including watercress, sorrel, celery, fennel, and bok choy. They also have some soil-based plants in the greenhouse, including opuntia (known as prickly pear cactus in the culinary world), cape goose berry, and miracle berry. Eco Conscious Aquaponics plants its seeds in coconut fiber, a sustainable byproduct of the coconut industry. The inert medium retains water and has high porosity, like a sponge, while also holding air even when fully saturated. Coconut fiber also has an ideal pH and is inhospitable to fungal growth. Unlike other aquaponic operations that grow and harvest fish for food, Eco Conscious Aquaponics uses long-lived fish such as catfish, koi, and goldfish, which will not be harvested and exist only to supply nutrients to the plants. It is an entirely organic operation and pest management is handled with marigold plants to deter insects and yellow sticky tape to snare flies. The Eco-Conscious Aquaponics founders are young; Cantando is 23 and Garland is 30 and the farm is entirely self-funded. Both founders hold off-farm jobs to pay the bills. Nevertheless, the farm is completely self-sufficient and generates a profit. They reinvest 20 percent of profits back into the business. As with any startup, getting the word out about their product was an early hurdle. They went door to door connecting with local restaurants in Santa Barbara and offering samples to chefs. They also began selling to farmers’ markets in Santa Barbara and Santa Ynez. Staying diligent and consistent was the key to getting clients. Delivering freshly harvested, delicious, consistent produce has been the key to keeping clients. He acknowledges that operating in Santa Barbara where people are environmentally conscious and can afford to care about what’s on their plate is crucial to their success. In the future, Eco Conscious Aquaponics hopes to expand their operation to additional locations, diversify what they grow, and possibly pursue soil-based agriculture. “I don’t [see] anything wrong with growing in soil as long as the water is available and it’s a sustainable practice,” Cantando says. General information on aquaponics: Aquaponics uses up to 90 percent less water than soil-based operations, making it especially viable in drought-prone areas. It is a system of aquaculture in which farmed fish supply nutrients for hydroponic plants, which act as a biofilter for the water. Just as important, plants receive adequate hydration for superior flavor. Additionally, it is a closed-loop system with no fertilizer runoff.